Japan has announced that it will restart two nuclear reactors - the first to go back online since all the country's plants were closed following last year's Fukushima crisis. Japan's 50 reactors were shut down for routine maintenance after the meltdown at the Fukushima power plant, which was triggered by a massive earthquake and tsunami. Prime Minister Noda made the announcement after meeting the governor of Fukui prefecture, Kazumasa Nishikawa, who gave his approval for the decision. The owner of the Ohi nuclear power plant, Kansai Electric Power, has been asking residents to save electricity ahead of a hot summer and it has been planning rolling blackouts to cut energy usage. But blackouts were extremely unpopular, especially among factory owners, when they were imposed in Tokyo last year and Prime Minister Yoshihiko Noda has repeatedly said that it's crucial for the nation's economy to restart some nuclear reactors. Despite the severe power shortages that Japan faces, many people are still against today's decision to restart the two Ohi power plant reactors and there have been protests against the decision. Some local politicians, including Osaka mayor Toru Hashimoto, say their approvals have been limited to the Ohi plant and only during the hot summer months. But the prime minister has said he will continue to assess whether other nuclear reactors are safe to be restarted. The prime minister then held talks with the minister of economy, the minister in charge of the nuclear accident and the chief cabinet secretary, before making the announcement. "Now that we have the approval from the autonomous body where the reactors are relocated, the four ministers concerned made the decision to restart the reactors," Mr Noda said, according to AFP news agency citing local media. Mr Nishikawa told reporters the agreement was reached to "help stabilise livelihoods and industry". He said he had given his approval because he had been "assured of the government's safety efforts". 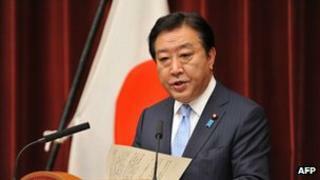 But Mr Noda still faces stiff opposition from lawmakers and the public, says the BBC's Mariko Oi in Osaka. According to the latest poll by Jiji news agency, 46% of the public is still against the move to restart the reactors in Fukui, she says. Nuclear power used to provide one third of Japan's electricity.